In a guest post on Thoughts at the Trust for Financial Capability Week, we asked Helen Li, Researcher at Behaviour Change to explain what behavioural theory can tell us about people and money. It all began when Richard Thaler, Dan Ariely and other psychologists began to explore why traditional economic theories consistently failed to explain why people weren’t doing what they were expected to do when it comes to money. Financial products and systems are often built around traditional economic theories, so they tend to operate on the assumption that people make rational decisions about their money. However, the reality is very much the opposite. People aren’t rational with their money. What people actually do, is often influenced by all kinds of cognitive biases and social and emotional factors. This wasn’t just the case for money – generally there seemed to be a significant gap between what we expect people to do and what they actually do. So Thaler and the others proposed another way of looking at people’s behaviour. This became known as behavioural economics, or broadly speaking, behavioural theory. Behavioural theory suggests that in general, people are biased towards immediate benefits over longer term ones and this is particularly relevant to how we handle our personal finances. Instead of saving for tomorrow, many of us just want to spend and reap the rewards now. This explains why 4.1 million of Brits are struggling to keep up with bills and credit card payments, and 12 million are not saving enough for retirement. It also argues that people’s everyday decisions about money are often heavily influenced by cognitive biases. To take one example, mental accounting bias describes how people like to mentally divide up their money for different purposes. A classic illustration of this bias in action is when people save money for a holiday in a jar, but might also be holding significant credit card debt. Even though they could probably offset some of that debt with the cash they’ve been saving for their holiday, they wouldn’t do it – because that money has already been mentally accounted for. Mental accounting may be irrational, but it can be quite a good way of keeping track of where your money goes. Having separate pots for different things like bills and savings, can encourage you to keep to a budget and stick to your goals. “Jam jar-ing” your money is an age-old way of budgeting – whether it’s saving in an actual jam jar or in a jam jar-like bank account, this bias can be used to our advantage. Studies show that when we pay with cash, it hurts – more than it does when we use more intangible forms of payment, such as credit cards or even Apple Pay. This is because the act of money leaving our possession is more salient when we pay with cold, hard cash. It might be more convenient to use your card all the time, but using cash more often can help you be more aware of where your money is going. You could try allocating a set amount of cash to spend for lunch one week and see if you’re able to stick to it. It’s clear that behavioural theory allows us to better understand how people really behave, such as how cognitive biases can affect our decision-making around money. But more importantly, it can inspire the development of new and innovative ways to help people make better financial decisions. There’s been a growing interest in how behavioural theory can be utilised to help people manage their money better and while it’s still early days, we’ve been trying to apply behavioural theory towards the area of financial inclusion and debt. 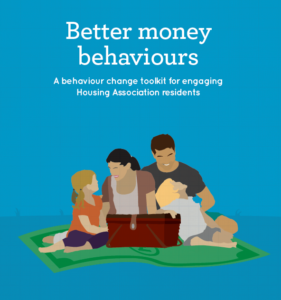 Working with the London Housing Financial Inclusion Group, we conducted some in-depth qualitative research and applied behavioural theory to develop the Better Money Behaviours toolkit. This toolkit comprises of 12 principles of engagement that addresses barriers social housing residents might face and ways to encourage them to seek help. 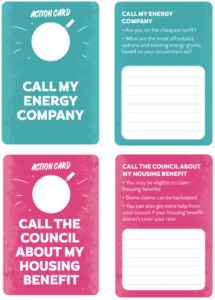 It offers some practical ideas to put these principles in action too, such as changing the wording for letters sent out to residents or capitalising on specific moments to reach out to them. With funding from the Money Advice Trust’s Innovation Grants programme, we then went on to develop six new nudging tools that could help advisers enhance engagement at critical points along the advice process. These were tested by money advisers and financial inclusion officers across four housing associations and National Debtline. One housing association saw a 20% rise in clients taking on actions suggested by their advisers. These tools were incorporated into a toolkit that was launched to the wider advice sector earlier this year. You can read about the event launch here and download the toolkit here. If you’d like to access digital files, please get in touch.  If you’re an adviser looking to take a crash course on behavioural theory and financial behaviours, you might find The Money Advice Trust’s Wiseradviser e-learning course helpful. In short, behavioural theory has much to offer on the topic of finance. As experts in the field of changing behaviour, we’re excited to see how this area of work will develop and keen to continue testing and learning different ways that behavioural theory can be applied to improving financial capability. For more information on Wiseradviser’s e-learning course on behaviour theory click here.